As readers of my ramblings will know I'm a huge Tom Burke fan. Ever since I saw him in (frankly not a great TV series) called POW back in 2003 or so, I have enjoyed watching his career grow, and it's great that he is now a household name - it makes life so much easier for me to say "Athos in the Musketeers" or "Cormoran Strike" when asked the question..."who??" I have been reading various versions of Schiller texts, including the MacDonald translation that Tom will be using for Don Carlos. 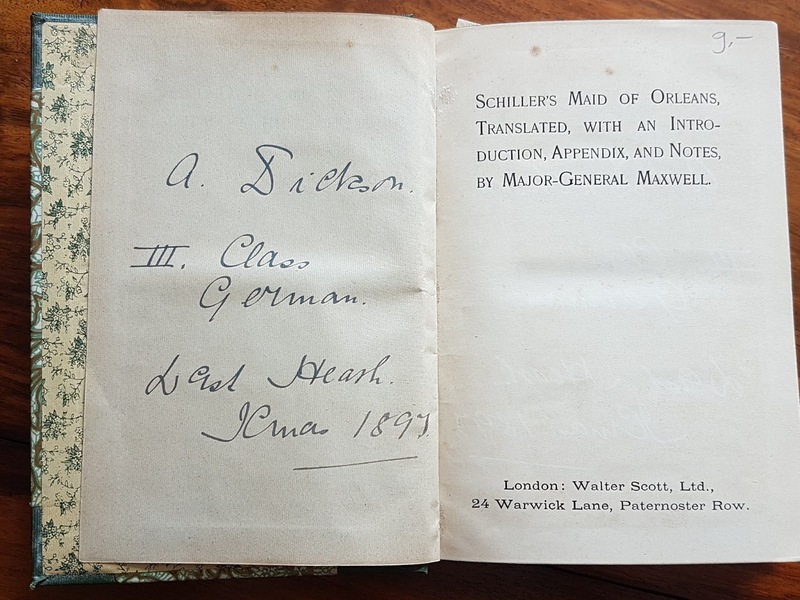 One of the most interesting "comparison" texts I've read so far was MacDonald's "Joan of Arc" versus a wonderful translation by Major-General Maxwell called "Schiller's Maid of Orleans." 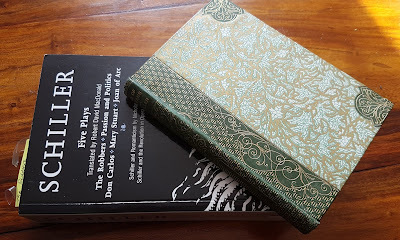 It is the same tale, one quite modernistic in it's language, the other very antiquated, almost Shakespearean in style. I'm not sure when it was published, but the inscription inside is dated 1897, and I have my good friend Nikki to thank for buying it for me. It's a quaint little book to be treasured. Reading these texts on my own (rather being lectured) allowed me the freedom of taking what I found of value out of the writing. Not, what is Schiller telling me, but, what am I taking from this? 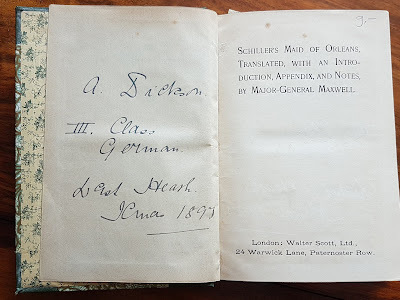 It was most interesting, so I stepped up a gear and read some various articles about Schiller, including the introduction from Oxford World Classics, Don Carlos & Mary Stuart, by Professor Lesley Sharpe. Her informative introduction looked at both the significance of the play and how it fitted in with the history of drama. Schiller wrestles with the ideas of a struggle for a more tolerant and humane society, and it is an interesting concept to come to terms with. (It was only after I finally decided to go to Exeter that I realised Professor Lesley Sharpe is an Emeritus Professor at Exeter university!) Suddenly the idea of going was becoming more exciting, an interesting subject with a bit of Tom thrown in...but Exeter is a long way away for a 90 min talk! Now, I'm not one to delve into detail about my private life online. Suffice to say, things not going too well with "father-in-law" so we're taking good weeks with bad weeks. This week seemed to be a safe week for me to risk driving to the other end of the country. Exeter can be a bit of a pricey place to stay on your own (normally I'd be sharing a room with a fellow Tom fan, but no-one on the WA group had said they were going, and I can't be relied on to organise to go anywhere at the moment without cancelling last minute) however, it was the perfect time of year to grab a bargain priced room at the university. So no more excuses, time to get in the car and have a good night being educated and entertained. It was a 5-10 min walk to the theatre which sits atop of a steep hill. As I staggered into the bar, I was asked if I was ok. Yes, I replied, at least once you've given me a pint I will be. £4.50! £4.50!? It was a £1 a pint at Preston...no wonder I didn't spend much time in lectures! Anyway, as I supped on my beer and read through some Schiller notes I'd made, I heard a familiar voice. Tom had walked in and was greeting some people. Tom wandered over to the bar and I thought, I know those faces too, it's the WA group, so I wandered over to say hello, at which point Tom turned round and came over and said hi to me! Bless him...that certainly made the 5 hour drive all the more worthwhile. 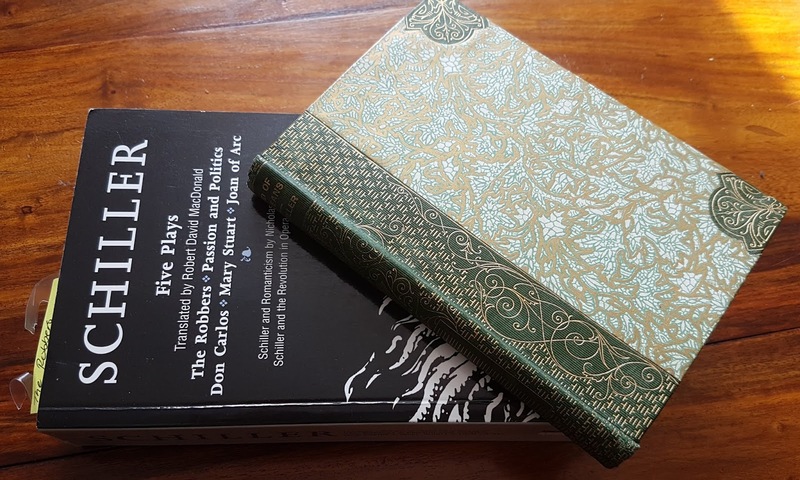 The free event was put on by the Northcott Theatre and featured Professor Gert Vonhof, Associate Professor in German at Exeter, specialising in German Poetry from 1750-1850 and an authority of Friedrich Schiller; the director Gadi Roll and Tom, who plays Rodrigo, Marquis of Posa. 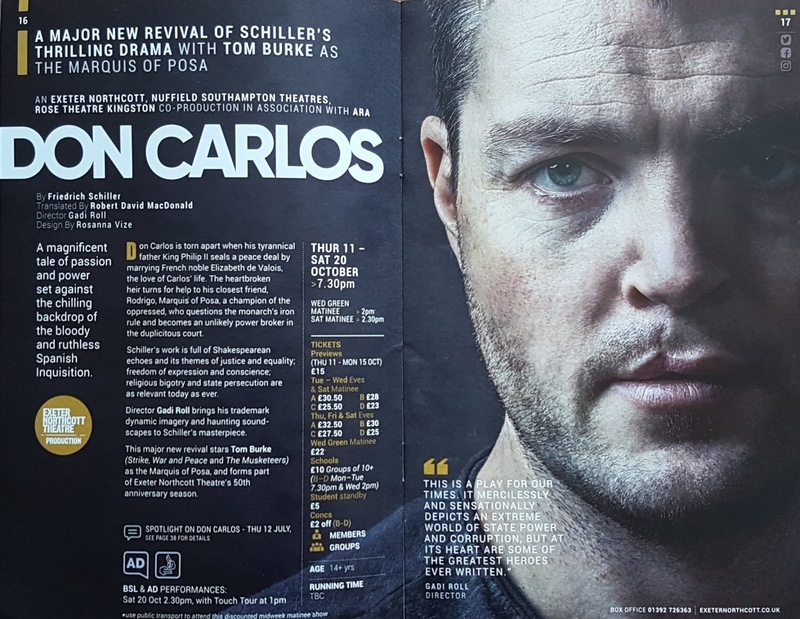 Don Carlos is a story told against the backdrop of the Spanish Inquisition, it is therefore a tale of ruthlessness, power and passion. Tom and Gadi last worked together in 2007 in a production of Ödön von Horváth's Don Juan Comes Back From the War. It was clear from the evening they were good friends and enjoy working together, so it was interesting to hear their thoughts on the play, and their ideas and insight for creating a unique and dramatic staging of a theatre production. After hearing what they had to say, I'm really excited to see the play in October and to return to the Northcott. In a first for the theatre, the event was live streamed, so rather than writing about what was said, I've attached a link below to Exeter Northcott Theatre's Facebook page. The link below should work until Northcott remove their video! Note it only starts playing at about 12:30 otherwise you sit watching Tom's static face... which is obviously not a problem!!!! After the Q&A's ended I headed back to the bar and sat with the rest of Tom's fans. Judi Spiers came over to say hello and we managed to persuade her to sit and chat with us! Tom also joined us all and chatted for a short while before leaving with Gadi. It was a lovely end to the evening and after they left, I ambled back to my room, watching the students larking about, and I was transported back to my student days when I would go to the theatre and come back to my digs to do a write up for the next day's journalism lecture. Well, at least I didn't have to worry about that this time...instead I could just make a cuppa and watch the world go by! Nuffield Southampton - 23rd October to 3rd November and Rose Theatre, Kingston 6th to 17th November.